20 years after first landing on our shores, the Hyundai Elantra has grown and evolved into a courageous and competent fighter in the C-segment sedan war, where names like Corolla and (to a lesser degree) Jetta tend to dominate the sales battles. 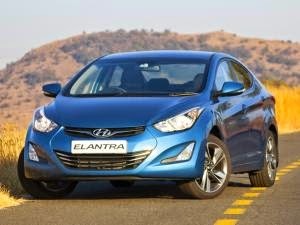 The Elantra's real coming of age coincided with the launch of the current generation, which hit the scene in 2011 and then marched on to victory in both the South African and North American Car of the Year competitions. Much has changed since then - not least the arrival of a much-improved Corolla - and Hyundai's response to the sands of the hourglass was a mid-life refresh a few months ago. Hyundai hasn't really messed with the basic recipe as three years down the line, this Elantra is still among the most striking designs in its segment. It's a rather elaborate collection of swoops and curves that Hyundai would call 'Fluidic Sculpture'. At worst you might call it a bit fussy but it should ultimately swing more thumbs towards the sky than the ground. The upgrade saw stylists polish a few details here and there, resulting in fresh front and rear bumpers, a new grille, modern-looking projection headlamps, LED light guide and LED taillights. The 1.8-litre version falls away, leaving you with a single 1.6-litre option mated to either a six-speed manual or automatic gearbox. Thankfully Hyundai has added some glamour to the 1.6 by binning those rental-spec plastic-shod steel wheels in favour of snazzy new two-tone, 17-inch alloys. Throw in one of the tasty new colours, like the Tropical Blue you see in the pictures, and the Elantra looks more at home in your driveway than in the rental return bay. Some notable plastic surgery also makes it better to look at inside. The previous version looked rather cartoonish around the central dashboard, but Hyundai has given it a far more mature look by moving the central air vents to the upper dash, among other tinkerings that mainly affect the ergonomic systems. Finicky as this might sound, it is still let down by a few details, such as the Plain Jane gear knob that looks like it was nicked out of a 1988 Mazda 323 and the abundance of covered-over switch housings lower on the console. Sure, you could hardly fault the overall appearance of the interior and the quality of the materials, it's just that if Hyundai is charging almost-premium money for a car then it should at least get the little details right, like Volkswagen does. When it comes to the bigger details, like ensuring enough space for you and your brood to stretch out, this car feels spacious front and rear, while the boot is suitably enormous. IOL mot dec17 Elantra c Repositioned air vents give the cabin a more mature appearance. Pack it up for a cross country trip and the Elantra will quietly get on with its business of getting you there in comfort. The ride quality is cushy and it's really quiet inside - Hyundai has been really prolific with the NVH engineering, which was further improved in the latest facelift. The engine does as much as you could expect from a normally-aspirated 1.6-litre, which delivers 96kW and 157Nm. It would be a stretch to call it fast, but the motor delivers more-than-adequate performance both in town and on the open road, providing you work the gearbox when overtaking and climbing steep hills. It's a pleasant and comfortable car to drive, with no major ergonomic flaws - although the electric power steering system does still feel rather artificial, albeit better than earlier Korean products. As far as the value cookie crumbles, the R252 900 Elantra is priced right in the thick of its segment - there isn't any real price advantage here nor is there a notable features advantage. It does trump its rivals with a few items, such as dual zone automatic climate control, automatic windscreen wipers and park distance control, but it lacks the Corolla's rear-view camera and leather seats and you don't get cruise control like you do in a Cerato or Focus. 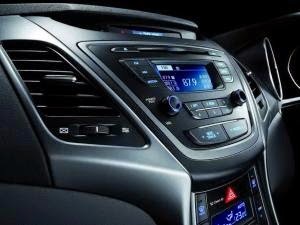 Like its competitors, the Elantra also comes with Bluetooth connectivity, a sound system with Aux/USB inputs, multi-function steering wheel and a five-year/90 000km service plan. The only real Elantra/Cerato after-sales standout is a five-year/150 000km warranty. 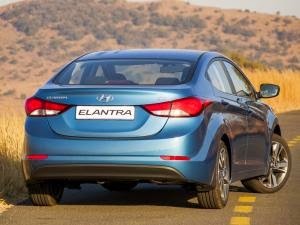 Priced well within the mainstream, the Elantra has to stand on its own merits to get the nod in a segment that's not short of fierce contenders. Thankfully, it puts up a strong enough fight by being a solid, stylish and refined sedan in its own right. Though it's not quite strong enough in any particular area to tower above its rivals and claim class victory, the Elantra is worthy of a spot on your short list.